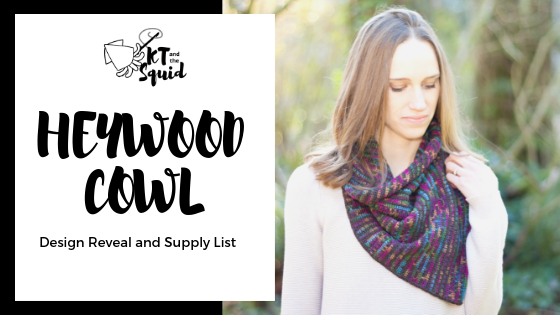 When I came up with the design idea for the Heywood Cowl crochet pattern I wanted to design something unique but easy to make. I also wanted it to be something you’d want to make for yourself now that the holidays are over. I would rate this pattern as easy. The cowl features fun stripes and the way I designed it you don;t have to worry about having a million ends to weave in (something I’m always worried about!). You’ll need to know how to chain and single crochet. You will also need to know how to work a spike stitch and change color but that will be explained in the pattern. I wanted this crochet design to use only a couple skeins of yarn with 1 skein being more colorful one skein being solid. My thought was it would be great use for all those beautiful hand painted sock yarns out there. Step 1: Join the KT and the Squid Official Group. Step 3: Create a Ravelry project page.